3-color image of the region surrounding the W28 supernova remnant; in particular the northern half of the shell is clearly outlined in Very Large Array (VLA) 90 cm radio emission (blue), indicative of non-thermal radition sources. Red shows MSX 8 micron infrared data, and green the Southern Galactic Plane Survey + VLA 20 cm radio data. The W28 remnant, at a distance of 2 to 3 kpc, is believed to be 35000 to 150000 years old (Kaspi et al., 1993). The more compact objects north and south of W28 are HII regions not directly related to the remnant. Image courtesy of NRAO/AUI and Brogan et al., NRAO Image Gallery; see also Brogan et al., 2006. See here for a version of the image where objects are labeled. It is a long-held idea that supernova remnants are acceleration sites for nucleonic cosmic rays. Indeed supernova shells are clearly seen as sources of high energy gamma rays (SOM 1/2005, SOM 3/2005), but for remnants such as RX J1713.7-3946 or RX J0852.0-4622 it is hard to prove that the observed gamma rays originate from primary accelerated nuclei as opposed to electrons. In other words, while supernova remnants are without doubt cosmic particle accelerators, we are not sure if they really accelerate the atomic nuclei which make up most of the cosmic rays. One approach to this problem is to study old (>> 10000 years) remnants. In old remnants, electron acceleration to multi-TeV energies is predicted to be very inefficient because electrons lose their energy faster by synchrotron radiation than they gain energy from acceleration in the shock (Yamazaki et al. 2006). Another solution is to look at remnants interacting with molecular clouds, where cosmic-ray nuclei find efficient targets to generate gamma rays, with the gamma-ray flux tracing the clouds. In either case nucleonic particles could be the dominant source of VHE gamma radiation. The W28 remnant (top image) fits both requirements. It is rather old - maybe 35000 to 150000 years - and in particular at its northern and northeastern boundaries it is propagating into dense clouds. The gas in the region shows clear signs of interaction with the supernova shock wave, such as 1720 MHz OH masers (e.g. Claussen et al. 1999) and high-density shocked gas (e.g. Reach et al. 2005). A total of 42 hours of H.E.S.S. observations of W28 reveal a complex pattern of gamma-ray sources (Fig. 1) : a northern source with a significance close to 8 sigma coincides with part of the radio-bright region of the remnant (Fig. 2). In the south, a few tenths of a degree beyond the apparent rim of the remnant, there extends a complex of sources, with about 10 sigma significance, and indications of a three-peak structure. The detailed morphology of this source complex is still under investigation. All source regions exhibit power law spectra with spectral indices similar to those of other galactic sources (~2.5) and flux values at a level of few percent of the Crab flux. The structures seen in very high energy gamma rays correlate to a large extent - but not perfectly - with the distribution of molecular gas as seen in the NANTAN CO survey of the region (Fig. 3). The east and central peaks of the southern emission region line up very well with HII regions seen in the MSX infrared image (top figure, and stars in Fig. 2). 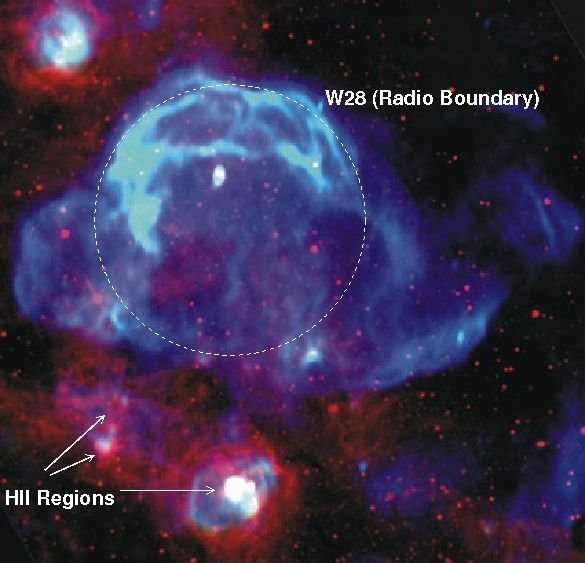 This suggests that the W28 remnant may serve as a cosmic-ray accelerator, illuminating the gas clouds, similar to the situation near the Galactic center (SOM 3/2006). Assuming gas densities around 104/cm3, an energy content in cosmic rays of order 1048 ergs is required to account for the gamma-ray flux, well within the range of numbers typically assumed for supernova explosions. In addition, the star-forming HII regions with hot stars may contain cosmic particle accelerators, akin to the situation in Westerlund 2 (SOM 12/2006). Fig. 1: H.E.S.S. gamma ray sky map of the W28 region (preliminary). Colors give gamma-ray intensity (events/hr); the map is smoothed. Green contour lines show the 4, 5 and 6 sigma contours for the gamma-ray signal, integrating gamma-ray counts over a radius of 0.1 degr. The north source contains about 280 gamma rays, the south complex about 650 alltogether. The dashed circle indicates the radio boundary of the W28 remnant. The stars show locations of H II regions, see also top image.